The boys volleyball team started off the season losing eight of its first 10 nonleague games, but dramatically turned things around when they started league play, winning a league title with a perfect 10-0 record and qualifying for CCS. It was the fourth league title for the boys volleyball program in school history, and the first since 2009. In the first round of CCS, the Eagles hosted Westmont in a five-game battle that eventually went to the Warriors. All told, they ended their season with a 16-12 record. Luke Wu, grade 12, thinks this team is only going to get better. “Next year, I know they will go to greater heights! With so much raw talent and such young players, I know that they will only get better and improve in skill,” he said. Playing in the SCVAL, Andrew Gu, grade 11, was named league MVP; Ray Song was named Junior of the Year; Chris Gong and Charlie Molin were co-Freshman of the Year; Song, Gong, Molin and Jonathan Schwartz, grade 11, were named to the first team; Wu, Jarrett Anderson, grade 9, and Kurt Schwartz, grade 12, were named to the second team. In addition, the team was a CCS scholastic champion with a 3.6760 GPA. It was an exciting year for the boys tennis program. Competing at the California Tennis Classic in Fresno early in the season, the Eagles went 1-2, but there was more to this weekend than just numbers. After winning the division 4 championship in the tournament last year, the Eagles were moved up two divisions to face some of the best teams in the state. Their sole victory came against defending section champ Clovis West, proving that they could play with the big boys. The team then finished the season in third place in the WBAL, which produced a CCS berth. In their first-round matchup, the Eagles were able to defeat Santa Cruz 5-2. However, their season ended in the next round of CCS as Gunn High defeated Harker 5-2. The 2016 swim season was full of amazing individual and team achievements. Jack Farnham, grade 11, was the league champ in the 100 backstroke; the girls 200 medley relay and 400 free relay team of sophomores Taylor Kohlmann and Vivian Wang, and seniors Grace Guan and Angela Huang took second at the league finals; Guan took third in the girls 100 butterfly and 100 backstroke; Michael Auld, grade 11, was third in the boys 500 freestyle; and the boys 400 free relay team of Farnham, Auld, Justin Culpepper, grade 11, and Alex Yu, grade 9, was third in league. The Harker softball team started the year on fire as it went 4-0 in its first four games, winning each game by an average of nine runs! The Eagles would finish the season tied for fourth in the WBAL with a 6-10 overall record. Leading the team offensively were Grace Park, grade 11, and Kristin LeBlanc, grade 10. Park led the Eagles in RBIs (15), doubles (6) and home runs (2). LeBlanc led the team in hits (22), runs (17) and batting average (.537). “I’m already excited for next year and I think that we have a very good shot of making CCS,” said LeBlanc. Harker softball was well represented on the WBAL All-League Team as LeBlanc and Anika Rajamani, grade 9, were named to the first team, Park and Marti Sutton, grade 11, to the second team, and Alisa Wakita, grade 12, received an honorable mention. It was a tough season for the girls lacrosse team as team members played their hearts out through a 2-18 season. After coaching the team for nine years, Andrew Irvine took on an assistant coach role with the birth of his daughter. “I am so proud of the all the girls for pulling the team together during this transition and keeping the program moving forward,” said Irvine. In addition to being a CCS scholastic champion, leading all CCS girls lacrosse teams with a 3.9098 GPA, the team also received many All-League awards. Alayna Richmond, grade 11, was the Defender of the Year in the WBAL Skyline Division; Elise Mayer, grade 9, received second team honors; and Taylor Iantosca, grade 11, and Natasha Mayor, grade 12, received honorable mentions. The varsity baseball team ended its season with a 9-13 record, but the future looks promising for this team. With only three graduating seniors on a 19-man roster, a solid core of players will return next year. “Even though we will only have one senior next year, we’ll have eight to nine juniors, all of whom will be beginning their third year on varsity,” said coach Mike Delfino. “So, we’re definitely optimistic about the next few years.” Miles DeWitt is one of the seniors leaving the team this year. He led the team in RBIs. “I would always give an extra effort because I knew I wanted to finish my last year playing hard,” said DeWitt. It was one of the best years in Harker history for the track and field team! Every meet seemed to produce multiple personal and/or school records. At the WBAL finals, the Eagles had 14 season bests, and five athletes earned trips to the CCS championships. 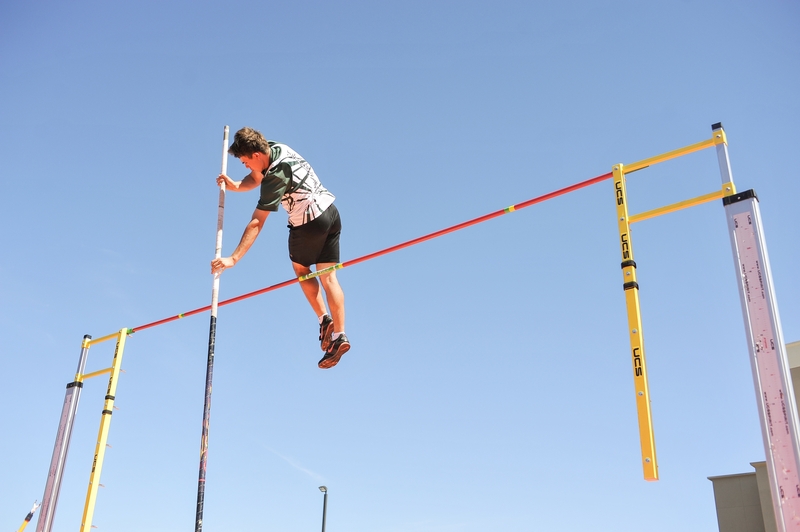 Davis Dunaway, grade 11, took first in the pole vault and second in the 300-meter hurdles in the WBAL finals. At CCS, Dunaway cleared his opening vault and placed seventh in his 300-meter hurdle heat. Demonte Aleem, grade 9, took first in the WBAL in the shot put and was the only freshman thrower at CCS, where he finished 28 out of 34 athletes, setting the school record in the process. Kevin Wang, grade 12, finished second in the WBAL in the discus, earning a trip to CCS. Anthony Contreras, grade 10, finished second in both the 200 and 400 at the league finals, and placed fifth and sixth respectively in his heats in each event, but did not make the cut for the finals. The boys team finished the year with a 3.4807 GPA, making it a top five scholastic champion. Finally, Niki Iyer, grade 11, continued her amazing career as she won both the 1600 and 3200 league finals. She went on to compete in the 3200 at CCS and the state finals, winning at CCS and placing third at state. Iyer was named the WBAL Girls Track MVP and a first team selection. Dunaway and Aleem also were first team selections, with Wang and Contreras earning second team honors. What a year for the boys golf team! They were WBAL champs for the third consecutive year and enjoyed a second-straight undefeated season, which included 22 consecutive league wins. They had a second place finish at CCS, third place finish at NorCals, and sixth place at state. As for individual honors, Ryan Vaughan, grade 11, was named WBAL player of the year; Avi Khemani, grade 11, was named to the WBAL first team; and Dakota McNealy, grade 12, Colt McNealy, grade 11, Scout McNealy, grade 9, and Sandip Nirmel, grade 11, were all named to the second team.